OK - here we go. The idea is to keep this ladder as simple as possible. 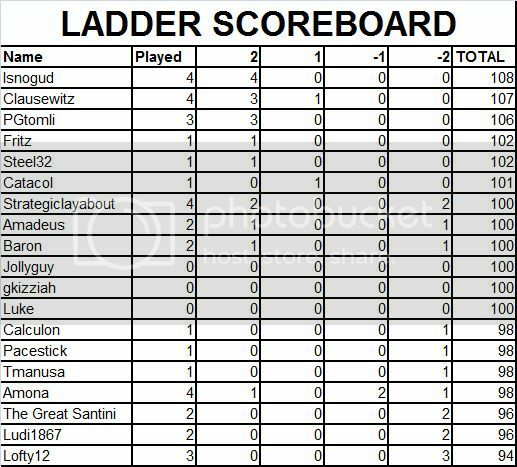 Rules are as simple as I can make them; ladder table will be updated as we go along. Please post any questions or issues into the alternative questions and issues thread. Thanks. Matches played as full length games of the 1939 World at War scenario. All players start with 100 ladder points. At the end of each game the winner is given a points bonus as listed above; the loser has the same number of points taken way. All players must complete a minimum of 4 games before the end of December 2014 to qualify for a final ladder position. All game settings to default. Soft builds therefore off. Negotiated surrenders at any point are allowed. Both players must agree on whether it is a 2 point or 1 point surrender. I am perplexed with all of these very early surrenders. Anyone have any thoughts? I am sorry about my match. Played aggressive as Allie. DOW Denmark which is very very (too) bad for Allies. After DOW on Norway some turns later USA was at 0% War Readiness. Sweden came to Axis and at the beginning of Barbarossa I saw about 70 ground units only for Germany. I usually have 40-50 max at that time. With nearly no income for Allie (US) and this huge German Power I surrender. What I miss in the game is a display that shows the expected effects when DOWing a nation. He is unexperienced, it was his first PvP match in SC ever. Did a Sealion in Summer 40, conquered British Isles by December 40. Barbarossa steamrolled over Russians in 41, took Moscow, Leningrad, the Caucasus and Voronezh in Spring 42, Russians down to about 20 units to 100 German, Stalingrad would have fallen in 2 to 3 turns too. Japs secured Southern China by November 40, Pacific offensive took everything including Hawaii in December 41, Advancing into India in Spring 42. USA made in June 42 only 390 MPP, UK 150, Russia about 200. Delhi would have fallen in the summer, I was preparing assault on Australia to take Canberra, the last victory objective. The game would probably have ended automatically with a decisive Axis victory in Spring 43. LOfty12 fought bravely, and I admire him for not giving up the ladder altogether. I am sure he will learn very quickly. Patch 1.03 is imminent. Games started under 1.02 will obviously be finished under 1.02. As soon as 1.03 is out then any new games must be played in 1.03. Many players are still in tournament which utilizes 1.02. The requirement of 1.03 will require players to have two versions running. Is this necessary or could ladder use 1.02 until possibly summer with a conclusion and then start new ladder fresh with 1.03? Running both installations is ridiculously easy - just copy and paste the 1.65Gb AoD into another folder named AoD 1.03 or something like that, and then patch that folder. Keep the original folder for 1.02. I dont think we want to wait 11 months to run 1.03 - players can negotiate to play under 1.02 if they really want, but seeing as a few bugs are fixed in 1.03 (I am cursing the Adana rail bug in one game right now already!!) then why wait to use it? Strategiclayabout (axis) scored a 2 point victory over Amadeus (allies) in June 1941. PGtomli (allies) scored a 2 point victory over Baron (axis) in December 1940. Amona (axis) scored a 2 point victory over Lofty12 (allies) in June 1942. Isnogud (axis) scored a 2 point victory over The Great Santini (allies) in August 1942. Clausewitz (axis) scored a 1 point victory over Amona (allies) in May 1947. PGtomli (axis) scored a 2 point victory over Strategiclayabout (allies) in August 1941. Isnogud (axis) scored a 2 point victory over Ludi1867 (allies) in February 1943. Clausewitz (allies) scored a 2 point victory over Ludi1867 (axis) in 1946. Isnogud (allies) scored a 2 point victory over Lofty12 (axis) in February 1942. Steel32 (axis) scored a 2 point victory over Lofty12 (allies) in March 1943. Strategiclayabout (allies) scored a 2 point victory over Pacestick (axis) in July 1943. Clausewitz (allies) scored a 2 point victory over Tmanusa (axis) in 1944. A quick note to all players - take a look again at the victory conditions. There are a lot of early surrenders happening in the years 1941 - 43 which to me seems odd!! A 2 point defeat hits your score hard... but could you fight on and hold out for a 1 point defeat? Unless your position is absolutely hopeless is it not worth trying to see if you can fight for that 1 crucial point? Just a thought... If the ladder is eventually decided by a single point in terms of score then perhaps some players will regret not fighting on..
Also - we have lost a player. Real world issues have forced Amona to retire from the ladder. A great pity because he is a reliable player who presents a good challenge, and his match against Clausewitz which went right to the final turn of 1947 sounded like a cracker!! I will look at his list of games, and make some new matches for players now that he has pulled out. I will, however, leave him on the ladder table. Who knows - in 6 months time he might want to rejoin. Life has a funny way of producing the unexpected! As of February 17 - here is the updated scoreboard. Here are matches in play, and results, as of 17 February. If any of the data on here is incorrect then please let me know. Catacol (allies) scored a 1 point victory over Amona (axis) in July 1945. 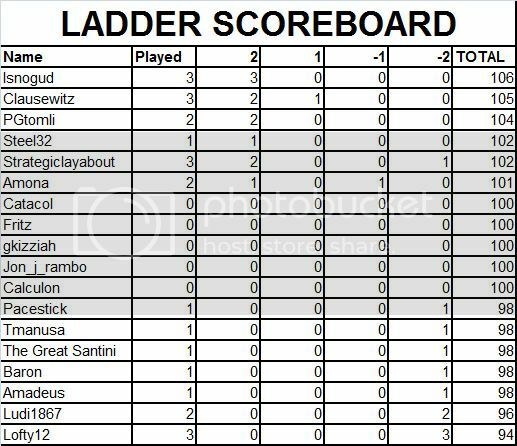 As of February 25th - scoreboard looks like this - Isnogud still out in front! PGTomli (allies) scored a 2 point victory over Ludi1867 (axis) in August 1941. Amadeus (axis) scored a 2 point victory over Amona (allies) in July 1943. - We discussed it before but the problem can be Chungqing. The chances to recapture it as Allies are very low, it nearly always falls to Japs and usually early. It's easier for Allies to go for 2 points victory as Tokyo is more vulnerable than the chinese capital ! - It also explains why axis players are more willing to play to the end since their 1 point victory conditions are easier. But other than that since we have people playing each other for the first time. Because of skill difference or some moves and strategies are unknown it can lead to complete collapse quickly. - I don't know for others but when I surrendered early there was no hope at all to do anything. One-sided games arn't very fun . Most of those factors will probabaly even out after some time/games though . P.S. : sad to hear that about Amona, hope he'll be well whatever the problem is. You may possibly be correct. To me the problem with the 1 point allied conditions may not be Chungking - it is more a problem with Manila. The thinking behind a 1 point allied campaign is that it is possible to do it even if the IJN has secured a decisive naval victory against the USN and RN. BUT to take Manila on top of the various land targets actually requires a naval assault. Not possible to take Manila if the IJN rules the waves. This to me is the flaw with the 1 point allied campaign and I am wondering whether Manila ought to be replaced by Seoul as a 1 point condition. That way a clear defeat of Germany opening the gates for the Red Army in China and the Brits through India/Burma makes a win possible even if the USN is at the bottom of the ocean. The Japanese player is then challenged to do 2 things - win at sea but also hold on land. At present an IJN victory at sea guarantees an axis victory whatever happens on land. I may consider a change along these lines. Fritz (allies) scored a 2 point victory over Calculon (allies) in February 1943. Clausewitz (axis) scored a 2 point victory over The Great Santini (allies) in 1944. ... and I forgot to welcome our 2 newest members of the ladder: Luke and Jollyguy. Yes - your English is better than mine. I cannot edit the first post in the thread now, but the way you put it is much more clear! Now, 2 things spring to mind. 1. I wonder whether we might get to a situation where ALL these boxes are filled and everyone else has played everyone else? That would be the perfect ladder. Almost certainly not possible, but so many games have been played already or are in play that it would be good to see as much of the grid filled with results as possible by the time we get to the end! 2. 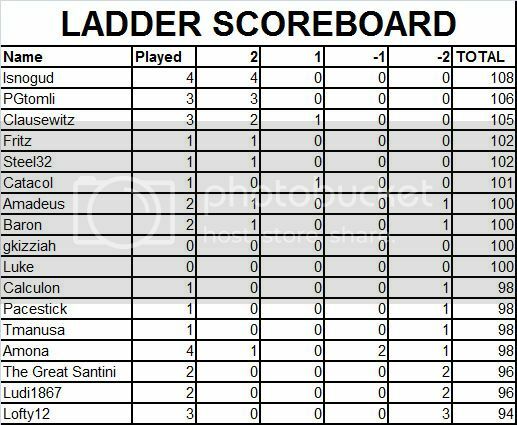 Secondly note that I have used the current ladder table ranking so that Isnogud who sits on top is on the top and left of the grid and players lower down in the ladder are progressively further down and to the right. 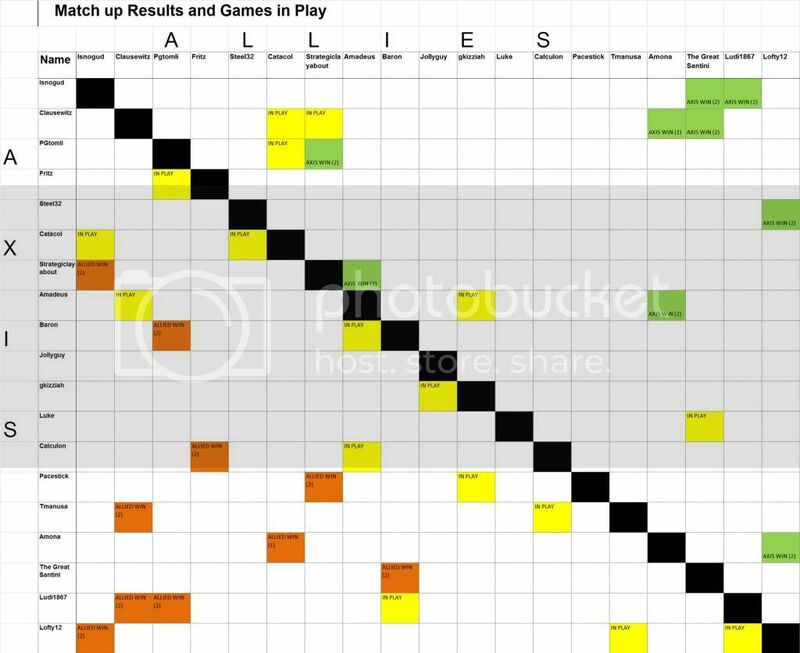 Now - if you follow the logic here: the closest games according to ranking OUGHT to be ones that are as close to the black diagonal line from top left to bottom right as possible. The most unbalanced games will be ones in the far top right or far bottom left of the table. It wasnt possible really to get a seeding system going to start with because I dont think many of us knew exactly how strong we were compared to others. To a great extent we are still finding this out. But we are beginning to get an idea. 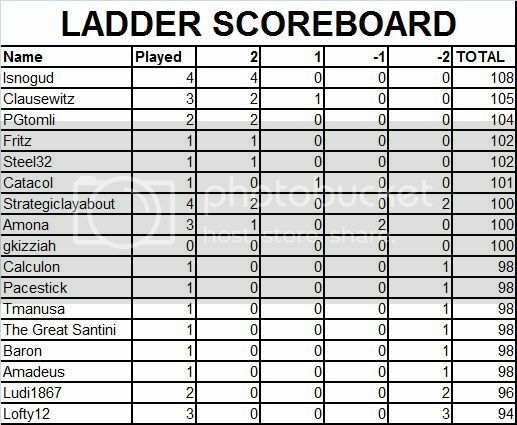 As the ladder evolves I will adjust the grid representation to keep players winning most of the their games to the top and left. And from now on I will try to create matches between players as close to the black diagonal line - in other words you will play people who are very close to you in the ladder table. This ought to be more fun - it ISNT much fun getting destroyed by someone much more experienced. Better to play opponents who are close to your own ability and try and get better gradually. As we get closer to the end of the year it wont be possible always to give players matches that look as though they will be close. The boxes will fill up and players will eventually HAVE to challenge those who are much higher or lower than them in the list. But as far as possible I will try to create games that look like they will be close. Lastly - and this is a new dimension we can add from here. You can all see on this grid who you have played and who you have not. I am quite happy if you want to make direct challenges to players yourself and report them to me. I will arrange the games for you if you wish.. but you can therefore look to arrange them yourself by spotting where the blanks are on this grid. Please just keep me informed if you do this so that I can keep all the data accurate. The ladder is now more than 10 weeks old. We have had 20 results in that time – many more than expected – and currently have 17 games in play. This is really good, and thank you for your support. We have also gained 4 players who joined late, and lost only 2 who have had to drop out for real life reasons. All in all very successful. 1. New games from now on should be started with 1.03. 2. Provided both players agree, loops should now be turned off in new games from now on. This is easy to do, and instructions of how to do so will be on the email that I send players when a new game starts. If a player is unhappy and wishes to keep loops on then this must be negotiated at the start of the game. 3. Remember – if you want a new game then let me know. Currently I am waiting for new opponents for both Clausewitz and Strategiclayabout. And now for the big change. The reason for this is simple. 1 point victory conditions are supposed to allow a player who has had a bad start to the game a way to try still to salvage a win by playing a much better end game. The current axis 1 point conditions work quite well I think. But there is a problem with the allied ones – if the IJN gains supremacy at sea then there is no way that the allied player can take Manila which was a requirement of the original 1 point objectives. So I have taken Manila out and instead brought in Seoul. I have also added London as a fairly obvious requirement in Europe. What will this mean? It means that if Japan gets a great start and successfully wins at sea and extends her power over the pacific the allied player can choose to put everything into a land war. Chungking is not easy to reach from Burma – but it can be done. Seoul can be reached from Russia. All other objectives can either be retaken (London, Paris, Moscow) or successfully defended (Delhi, Canberra) even if the IJN is dominant. I hope this might encourage players to take their games a bit longer and not surrender early on. If all players think through these objectives then I think there are good chances of victory for either side even if in 1942 one side is on top. Adapt your strategy. It may also prompt some players to go for the “easier” 1 point win from the start when playing someone who is very strong at the game. THIS CHANGE ONLY APPLIES TO NEW GAMES FROM NOW ON. GAMES CURRENTLY IN PLAY WILL BE DECIDED UNDER THE ORIGINAL CONDITIONS. I hope you continue to enjoy the ladder, even if you are in the bottom half of the table and struggling for wins. Stick with it – and victory will be yours! Strategiclayabout (allies) scored a 2 point victory over Clausewitz (axis) in March 1942.